WHEN THE French transit company Keolis landed an eight-year contract in January 2014 to operate commuter rail for the Massachusetts Bay Transportation Authority, the deal was hailed by T general manager Beverly Scott for its stringent "no-excuses expectation that the operator will run the trains on time." "No excuses" promptly became a catchphrase, invoked repeatedly over the past year whenever Keolis and its performance have been in the spotlight. A Nexis search yields dozens of news stories referring to the "no-excuses contract" the company signed. As commuter service all but collapsed under the crippling snowstorms that hit Greater Boston this winter, the state's new transportation secretary, Stephanie Pollack, bluntly insisted Keolis would be held to its tough performance benchmarks, despite the snowfall's historic proportions. 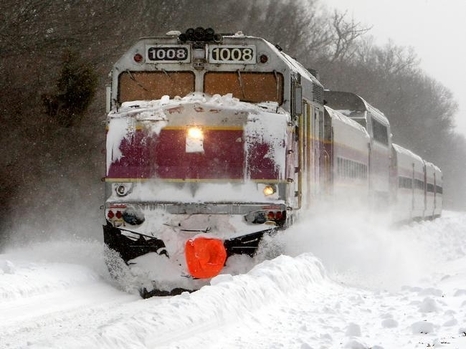 The MBTA's commuter rail service was all but paralyzed by the record-busting snowstorms that his Greater Boston in January and February. Here, a commuter rail train on the Newburyport line travels through Ipswich in February. "While we understand the challenges that our operator, Keolis, faces in operating the system," she said at one press briefing, "they signed on to a no-excuses contract." So the news that Keolis, citing the severe weather, has asked the MBTA to waive nearly $435,000 in penalties imposed on it for late or cancelled trains last month was greeted with predictable scorn — and chilly reminders of that "no-excuses" standard of service that the company had committed to deliver. Governor Charlie Baker, who in mid-February snapped that he was "sort of done with excuses, OK?," said last week through a spokesman that Keolis should "focus its energy on restoring full service to the commuter rail," not on trying to avoid fines. A statement from the MBTA was equally dismissive of the no-fine plea, advising Keolis to get the trains moving, and to put off worrying about "technical matters" — like being hit with hundreds of thousands of dollars in penalties — for a "more appropriate time." In an editorial, the Boston Herald pronounced it "mind-boggling" that Keolis would ask for relief while commuters were still fuming over February's miseries, when only 35 percent of the trains were on time. Wrong. Keolis is getting a bum rap. The commuter rail contract truly is demanding, and Keolis — which took over the service just eight months ago — has already forked over $3.2 million in penalties to the T for falling short. It has dutifully taken its punishment for late-arriving trains, staffing shortages, and maintenance and cleanliness issues — as its contract stipulates. Unlike the Massachusetts Bay Commuter Railroad Company — the politically-wired corporation that used to have the commuter-rail contract — Keolis doesn't collect lavish bonuses for trains that arrive on time. It also faces much stiffer penalties for poor service — as much as $12 million annually, a fourfold increase over its predecessor. But it did not enter into a categorical no-excuses deal, even if transportation officials have implied otherwise. The contract explicitly provides that Keolis "shall be excused ... for failure or delay in performing its obligations" if "an act of God, lightning, severe weather, explosion, flood, landslide, or earthquake" causes commuter rail equipment "to be unusable or substantially unusable." That is precisely what happened over the six weeks beginning Jan. 26, when the region was walloped with a record-busting accumulation of snow that paralyzed an aging rail system already prone to breakdowns. Keolis has taken plenty of lumps for its missteps this winter. It has responded with a management shakeup and public apologies, including one in the form of a full-page newspaper ad acknowledging riders' anger. Keolis agreed to a contract with demanding standards, but it can't be blamed for acts of God. But Keolis can't be blamed for blizzards, and it can't be blamed for invoking the "force majeure" clause in its contract that says so. Nor is the company behaving with unseemly haste in promptly raising the matter with the MBTA. That, too, is specified in its contract: In the event of a blizzard or other such act of God, Keolis is required to notify the MBTA within two days that it will be unable to provide full service for reasons beyond its control. To snipe at the company for not waiting until a "more appropriate time" to trigger the act-of-God exemption is to snipe at it for following the rules demanded by the state. Irritated passengers, sick of all the delays and inconvenience, may find it irresistible to lash out at the commuter rail operator, especially when they keep hearing that there was a "no-excuses" agreement. But public officials should know better than to encourage the scapegoating. By all means, hold Keolis to the high standards it signed on to — not to standards that no one could have met. "Like" Jeff Jacoby on Facebook.